Posted by Ray Poynter, 15 October 2018. Most individual numbers do not mean very much. In many cases, in order to see the real meaning in most data, you need comparisons. For example, if I tell you that the Belgian cyclist Eddy Merckx won 11 Grand Tours, you will no doubt guess that he was a good rider. But, when I tell you that 11 is the most any rider has ever won, and that only one other rider has won 10, and only one other rider has even won 8, then you start to get a sense of how special Eddy Merckx’s was. So, this post focuses on how to use comparisons to understand the story in the data, and how to use comparisons to communicate the story in the data. The chart shows three sets of comparisons. The first is a comparison between people who approve and people who do not approve of the President. Note, this is not a zero-sum calculation (i.e. they do not add up to 100%) because there are other options such as don’t know. The second is a comparison over time, the value for October 12 (52.5% Disapprove and 41.9% Approve) can be compared with the previous 630 days. This comparison shows that for most of 2018 the figures have been fairly stable with about 40% approving and just over 50% disapproving. Looking at the whole 631 days, the data show that except for the first few days after his inauguration President Trump has had more people disapproving of him than approving. The third comparison is the set of dots around each line. These dots show the different estimates from different polling companies. This comparison shows us how ‘wobbly’ any single measure can be. The variations are often much larger than the +/- 3% that pollsters often talk about. However, none of these data points or comparisons answer the key question of whether Donald Trump is more or less popular than is normal for a Presidents of the USA. 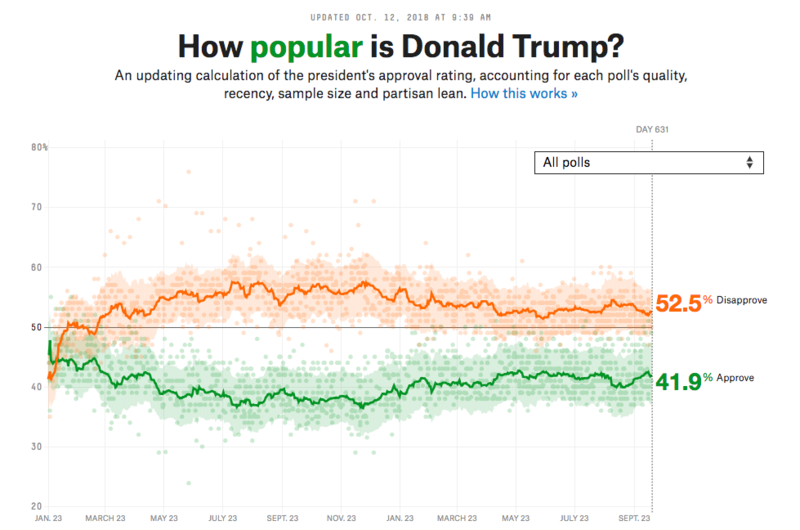 In this collection of charts, the green line on each chart is the net approval score for Donald Trump (Approval – Disapproval). 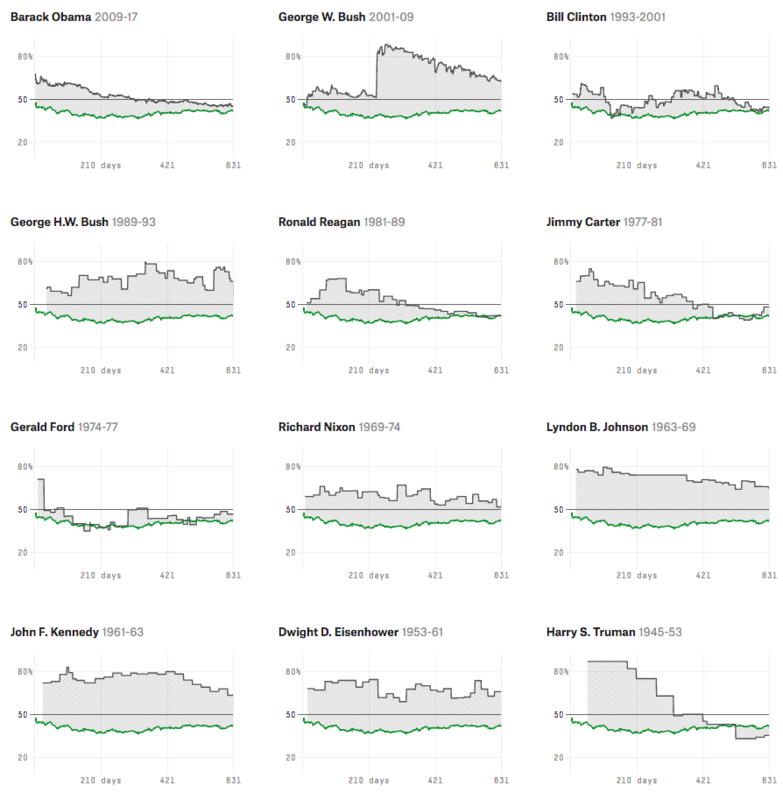 The grey line and area is the performance of every president back to 1945, in terms of their first 631 days. If a President was elected twice (like Barack Obama), it takes the first 631 days of their first term, to be comparable. From the comparisons it can be can see that no President of the USA has been as unpopular as Donald Trump has been in his first 631 days. Unpopular in terms of how much time their score was negative, and unpopular in terms of the total volume of negative scores over 631 days. The only President who comes close was Gerald Ford (who is a bit of a special case as he was not elected to the role, having been appointed Vice-President after Spiro Agnew had to resign, and President after Richard Nixon had to resign). However, even comparisons do not tell us everything we want to know. If the question was how does Donald Trump’s first 631 days compare to other Presidents, then the answer is clear. However, if the question was ‘Will Donald Trump win re-election in 2020?’ then the picture changes. Since there are two more years to go before the next election, it is impossible to say with any confidence what will happen. If we are looking for the data to give us a suggestion, we should probably focus more on the latest data, rather than the whole 631 days. In terms of recent scores, Donald Trump’s unpopularity is similar to that of Barack Obama, Bill Clinton, and Ronald Reagan all of whom won the elect two years later. His score is also similar to Jimmy Carter and Gerald Ford – neither of whom were re-elected. Fascinating. Thanks for pulling this together and for sharing! The power of data – even if by its nature it is rear view mirror. Would love to see the more forward looking qual data that perhaps provides the deeper understanding of where hearts and minds are really at and might be at in the future, combined with this data!